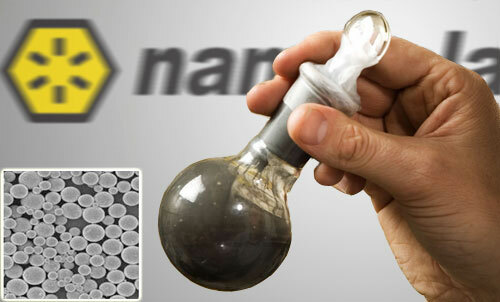 Nannosolar’s thin-film solar printing technology produceslow-cost solar cells and panels. Using nano technology they grow thin-filmsolar cells (nanoparticle ink) that can be printed on glass or flexiblematerials, which can be manufactured at a lower cost than the conventionalvacuum panels. This technology has been recognized as the first solartechnology that is cheaper than Coal. This is a big leap into clean energysources. The biggest criticisms to solar energy are thecost of manufacturing, installing and even maintaining it. Thin-filmtechnology is characterized by a CIGS (Copper,Indium, Gallium, Selenium) semiconductor printed on low-cost,Conductive aluminum foil combined with a Metal-Wrap-Through as back contact. Ituses very little of the expensive silicon, which is the main ingredient of theconventional solar cells (photovoltaic cells). And with the addition of usingexisting industrial printing and manufacturing industries technology. Solarcells and panels are produced in high speeds at low-cost. This decrease, if noteliminate, the cost issues of using solar energy systems. Another big critic to the solar energy technologyis the efficiency of solar panels. The energy generated is not as a high as ourcurrent/conventional sources and paying for the conventional energy source ismuch cheaper the having a solar energy system. This is actual true and still apresent issue for solar energy. However, the thin-film technology has beenrecognized to be cheaper than Coal. This means that by considering the energygenerated and cost, the thin-film technology will be more cost-efficient. Andnote that they are still working to improve the efficiency of the solar cells.In fact last October 2011, Nanosolar achieved a new benchmark of 17% apertureefficiency for solar cells fabricated using Nanosolarâ€™s non-vacuum, low costprinting on flexible foil technology. The technology is currently used by largecompanies which uses solar energy system in a large scale. I have not comeacross any reference on the web that confirms the use of the technology onresidences. Well, maybe there productions are all sold out to their companypartners. That is why they still do not sell to residences. It would be veryinteresting to know how much a single panel would cost. Would it really becost-efficient for residence owners like us? We will never know until it is available in retail. But nevertheless, this is an amazing clean and green technology.